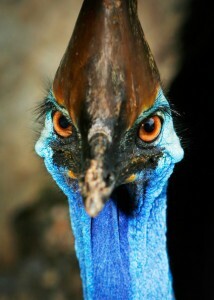 With two world heritage listed areas on the doorstep the opportunity to enjoy nature based activities is abundant. Guests can select from a range of tours and activities that ensure they are rested, relaxed and revived. 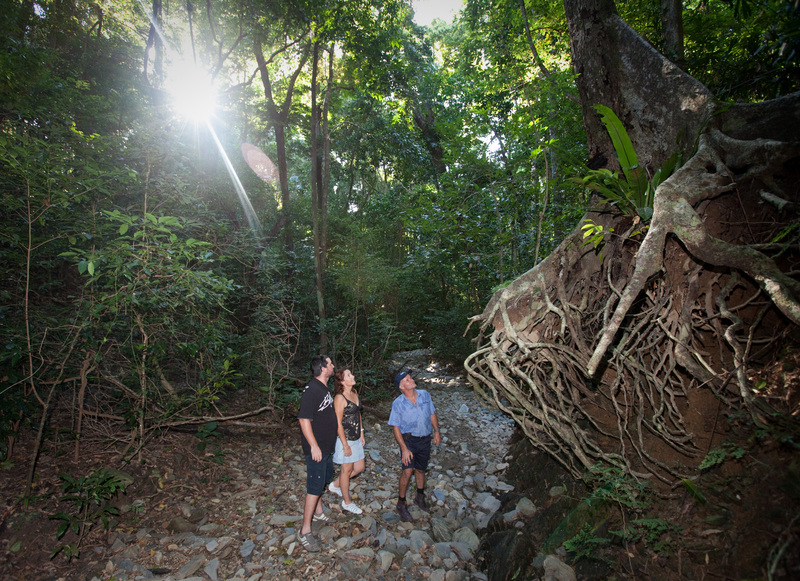 One of the most popular activities is the Guided Rainforest Walk through the Daintree Rainforest – one of the most naturally diverse areas on earth. The Daintree Rainforest has remained virtually untouched for millions of years and exploring even a fraction of it is an unforgettable experience. Led by a highly knowledgeable guide our rainforest walks offer a fascinating insight into the mysteries of the tropical rainforest – home to over a fifth of Australia’s bird species and some of the world’s largest and most striking butterflies. If you feel like exploring on your own, there are also a number of marked walking trails around the lodge. Guests can also enjoy a gentle cruise on the Bloomfield River, or ramp up the excitement with a guided fishing tour out on the Coral Sea. 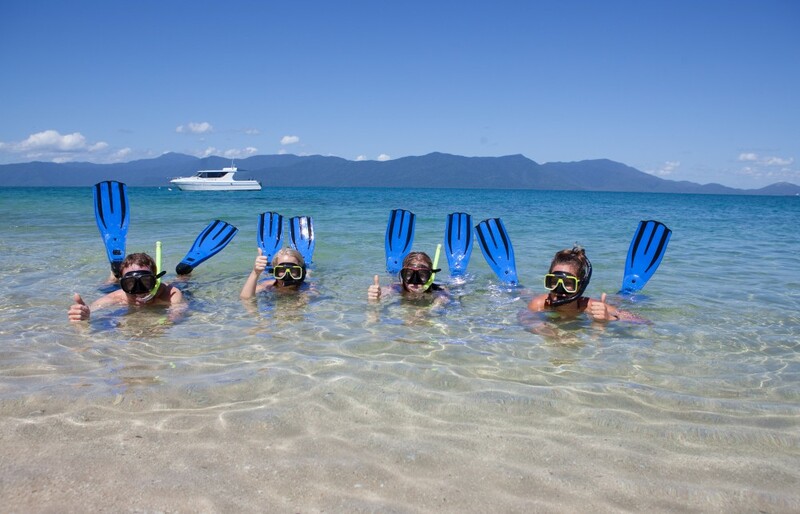 Guests can also cruise out to the nearby Great Barrier Reef aboard the Bloomfield Explorer for snorkeling and a gourmet picnic lunch at Hope Island. Guests can also visit Bloomfield Falls for an interpretive Indigenous tour, visit Cedar Bay National Park, or further afield to the townships of Cooktown or Laura. Around the grounds of the lodge, guests can enjoy the freshwater pool and jacuzzi offering stunning views over Weary Bay, fishing off the jetty, or pick up a good book from the library. 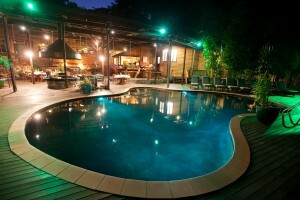 The lodge also has a spa with massage and beauty treatments available. 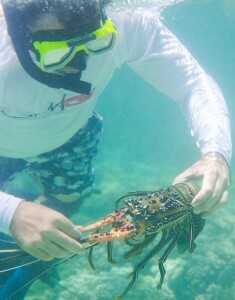 Crayfish are plentiful on the reef, and with the Bloomfield Lodge guides expert assistance, everyone gets to enjoy! Part of Bloomfield’s appeal is its mouth-watering selection of freshly prepared meals which are unarguably beyond extraordinary. With the use of quality produce (including local seafood) and immaculate presentation, the meals are a highlight of the guest experience. Served in a lush tropical alfresco setting overlooking the bay, each meal impresses more than the next, and is truly a delightful experience – especially for culinary enthusiasts. The menu changes daily and there is also the highlight of the week, the brilliant seafood BBQ buffet which is a sight to behold. 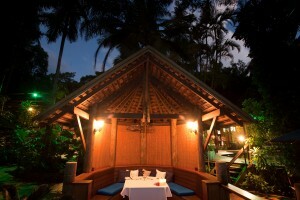 There is also the option for romantics to take advantage of private dining in one of the beautiful timber gazebos. This candlelight degustation experience is simply tantalising in every way! The relaxed Mulligan’s Bar – named after respected explorer John Venture Mulligan – is the perfect place to enjoy a drink – be it a quiet one as a couple, or to meet with fellow guests and exchange tales of your day. The wine list is extensive and provides ample choice to select matching wines for your meals.